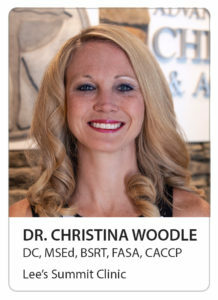 Dr. Christina Woodle has a passion for family Chiropractic and Acupuncture for all ages. Before entering her career as a Doctor of Chiropractic with a specialty in pediatrics (board eligible 2014) Dr. Christina received her Bachelors degree from Avila University in Radiological Sciences and became a nationally registered Radiological Technologist. Dr. Anthony Sala is a graduate of Cleveland Chiropractic College in Kansas City, as a Doctor of Chiropractic with a Bachelor’s of Science in Human Biology. He initially experienced chiropractic care after enduring a knee injury as a high school soccer player. After visiting his chiropractor, the knee pain was resolved and he resumed playing sports. More importantly, he was introduced to the positive nature of a healthy, prevention-based lifestyle. Dr. Sean Binkley grew up in tiny little Holton, Kansas. He placed three times in the State competition in high school wrestling and also participated in college wrestling. He still does occasional “old-timers” tournaments and is a referee for children as well. I grew up in various small towns across Maine. I started working in the eighth grade and played 4 seasons of sports from a young age. After giving up an opportunity to play college soccer and study accounting, I decided to attend The University of Maine in order to earn a degree I was more passionate about. I graduated with a bachelors of science in Kinesiology and physical education.